“Taxidermy Art.” It’s a thing. Or, more accurately, an art, as showcased in the wildly disturbing, wildly fascinating new book Taxidermy Art, out this week. Subtitled “A Rogue’s Guide to the Work, the Culture, and How to Do It Yourself,” the collection is curated by Robert Marbury, cofounder of the Minnesota Association of Rogue Taxidermists. And, oddly, published by the same art book label who did The French Laundry Cookbook. Why rogue? Think of this, ahem, “stuff” as pop surrealism with a heavy side of WTF … as well as a fan base that includes John Waters and Diablo Cody. This taxidermy tome presents a brief history of the skill (it all started with mummified pets in Egypt), its mission (mainly art, part conservation, a bit political muckraking) and a rundown of its more unusual practitioners (see: Walter Potter and his poker-playing squirrels). More importantly, TA showcases beautifully stark photos of 100 modern taxidermy creations. These are no museum dioramas. Instead: jewel-encrusted piglets, “Franken-pussies” (that’s altered cats to you), nardogs, steampunk bionic animals and Gucci-fied deer mounts. As Marbury stresses, no live animals were harmed during the making of these creations. Plus, there’s a DIY section: five workshops that cover everything from skinning/mounting a squirrel to skull whitening. Photos: (Top) Peter Gronquist, Untitled. Photograph by Jeremiah Alley. 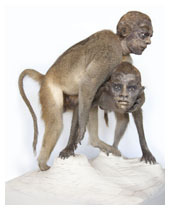 (Bottom) Kate Clark, Rivalry. Photography by Robert Marbury. Both from Taxidermy Art by Robert Marbury (Artisan Books). Copyright © 2014.